Wild Grass, the latest film by 88 year old French legend Alain Resnais, is a triumph of off-beat storytelling – from the opening theft of a neat yellow purse from a woman with a mountain of wild red hair to the sudden and inexplicable conclusion. Resnais has collaborated with many great novelists and playwrights over the years, including Margarette Duras (Last year at Marianbad), Alan Robbe-Grillet (La Guerre es Finis), Jean Gruault (Mon oncle d’Amérique), Jorge Semprún (La guerre est finie) and Alan Ayckbourn (Private Fears in Public Places, Resnais’ most recent film). 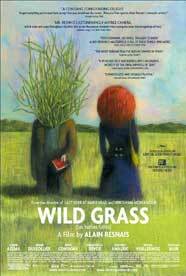 Wild Grass, which opened the New York Film Festival last fall, is based on the book “The Incident” by Christian Gailly and it is the first of his 13 novels to be adapted into a film. Resnais’ 22nd feature film is more than a curiosity at the end of a great director’s career – the film is energetic, superbly shot and wonderfully acted. The plot mixes mystery, comedy and melodrama genres in a free-spirited manner that calls to mind the work of French New Wave filmmaker Francois Truffaut’s elegant but somber films The Story of Adelle H and The Bride Wore Black. André Dussollier as Georges, the middle-aged man who finds the lost red billfold that has been separated from the handbag, and Sabine Azéma, who plays Marguerite, the woman who lost the purse, are veterans of film and theater who create their roles with a full range of humanity. Their actions are believable but impossible to understand – each react to the loss and discovery of the purse in ways that are unexpected, unpredictable, and wholly against their best interests. Resnais investigates their lives through the use of a narrator and internal monologues, continually pulling us deeper into their very human indecisiveness. George and Marguerite’s thoughts circle more and more precipitously around the act. His mind works over the problem with obsessive intent. “Which of the two pictures in her wallet does she look like?” he asks. Finally they no longer seem to remember where the attraction to each other came from. Framing the perfectly crafted dialogue is an impeccable sense of film style. The cinematography, the editing, the use of music (by film and TV veteran Mark Snow) show no sign of the filmmaker’s age – they are innovative and daringly realized. Color is used in bold and saturated strokes – the deep red of Marguerite’s tangled head of hair, the yellow purse that floats across the screen in a slow motion shot that becomes a repeated motif, the reflections of green and red street lights as Marguerite drives a Paris street, sure she will recognize Georges when he leaves a cinema (though she has never met him), the rich green ambience of a parking garage where Georges finds the red wallet, the blue light of the police station which finds Georges worrying if the officer knows “of his past”, Marguerite’s little yellow car that Georges attacks with a knife, the blue paint that Georges uses to cover parts of his home and front gate, a green light that bathes Sabine and Georges as they argue on the phone. The camera work of Eric Gautier (Private Fears in Public Places, The Motorcycle Diaries), seems in continuous motion, not to show off technique but for emotional effect. It sometimes moves closer to examine a reaction, other times pulls away to give the full context of a shot (for instance when Sabine discovers that her tires have been slashed). Another motif of the film is a floating overhead camera, whether moving across overgrown grass pushing it’s way through cracks in concrete or watching characters from above as their fates intertwine (for instance when policemen call up to Georges, who is painting the upper floor of his house, and prepare to interrogate him about his act of vandalism of Marguerite’s car). Resnais uses a witty way to reveal some of the interior dialogue – at times, when Marguerite or Georges are driving, seen from the back, their faces are superimposed on the passenger side of the front window, speaking their own thoughts. There is a 1940’s Hollywood cinema retro feel to the effect that is further developed by the neon red exterior of an art house cinema that draws Marguerite and George together and also by a mock Hollywood ending that Resnais teases us with before revealing the true fate of the fatally attracted pair. Continuing the film references, Marguerite, a dentist by trade, is also an airplane pilot who owns a spitfire airplane, much like the fighters that Georges dreams uneasily about after seeing The Bridges at Toko-Ri, a 1950’s film about a fighter pilot in the Korean war. Resnais has created a world that operates in a slightly off-kilter and thoroughly enjoyable way. The effect isn’t limited to the main characters. Georges has a wife who is strangely sympathetic to his new obsession, inviting Marguerite into her home in the middle of the night for a chat. Marguerite has a friend and business partner who at first recognizes the dangerous nature of this distraction (Marguerite becomes intolerant of the pain that her dental patients feel, for instance) but soon falls for Georges as well. It’s a comic and complete vision of lives that are unable to settle for a “normal” existence. Wild Grass is a mature and lively comedy that mixes obsession and mystery with a refreshingly experimental approach to storytelling. It makes us think and feel, which is what good cinema has always been about. This entry was posted in Film Reviews and tagged Alain Resnais, André Dussollier, Eric Gautier, Sabine Azéma, Wild Grass by Thomas W. Campbell. Bookmark the permalink.